SINCE THE DAWN OF POP-TART QUEST, ONE TART HAS STRUCK DIRE FEAR INTO OUR BREAKFAST WARRIOR’S HEART. TODAY, HE FACES THAT FEAR. THIS IS… POP-TART QUEST! I mean… ultimately, how bad could a Pop-Tart be? They are sugar and sludge and shell. It’s not landing the Hindenburg; it’s breakfast! Like, even the WORST Pop-Tart has still be okay, right? OH GOD, THERE IT ALL IS. WATERMELON SLUDGE. DASTARDLY , TART! Cruel, unfathomably evil Tart! I’ve erred! OH GOD, I JUST BURPED. 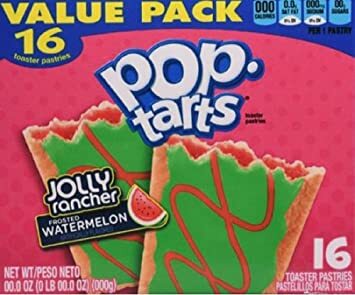 What malicious god allows these Tarts to be?! A-: I almost thought these were going to be palatable for a moment! I got a few bites in before it fully infiltrated my being. What Do You Think? : Oh my god, did you know there are essentially TWO of this flavor? WHY WOULD YOU DO THIS TWICE? I don’t know what the hell it is, but literally every “Watermelon-flavored” everything except ACTUAL WATERMELON has tasted like garbage. Except for those “Watermelon Sours” gummy candies. Maybe it’s because I’m one of those people who can taste cucumber (it tastes like rotten fruit to me), and watermelon is related (seriously, look it up- people like me often find both unpalatable, though I don’t in this case). But the artificial watermelon flavors are almost always horrible to me.